I'm not good at improvising in knitting. I am getting better, but I've never been one to change patterns or make up my own designs. I like to have the safety of a pattern that someone else has already knit, measured, and published so that I can better predict my outcome. This is partially why I've never been a big vanilla sock person. It just never occurred to me to knit a sock without a stitch pattern and to do so with a number of stitches that I choose, not with how many a pattern tells me. But then, I bought the Socktacular book which had options for heels, cuffs, toes, and stitch patterns for both cuff-down and toe-up socks. So, I pulled out my needles and knit my first pair of toe-up socks. Suddenly, I understood what a vanilla sock is. It's just a plain Jane sock. No special magic. If you don't know how many stitches to cast on, most women use between 56-64 stitches. If it doesn't fit? Wear them as slouchy house socks. Give them away. Rip out and try again with a different stitch count. Bored? Find a stitch pattern you like and use that for the leg and top of the foot. Don't know how to do the heel? 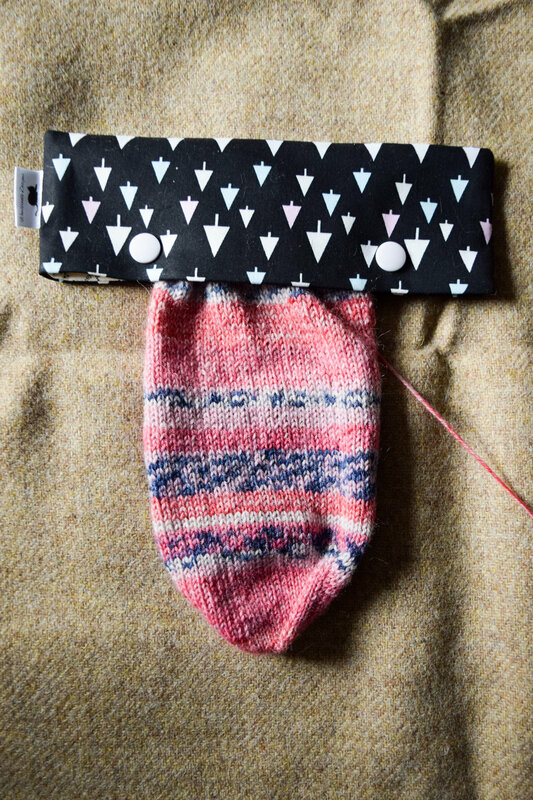 Find your favorite sock pattern and use that heel, or use a resource such as Socktacular or the Knitter's Handy Book of Patterns. Because really, what's the worst thing that can happen? Yarn is forgiving. You can rip it out and start over. Yes, you spent all that time knitting, but if it's a yarn you enjoy using (and I hope it is), knitting with it for even longer will be enjoyable, and wouldn't you rather spend more time creating something you will actually get pleasure and comfort out of wearing instead of just a pretty object that gets stuffed to the back of a drawer? Yarn is forgiving. I need to tell myself this over and over. I've never been one to frog projects. I plow my way through and keep that thing and never wear it, always deluding myself into thinking I will use it in the future. But vanilla socks have taught me that it's okay to mess up and try again.